In our second post in the #MyAdvent series, we catch up with singer/songwriter Nadine about what Christmas means to her. C Image Credit Image from Janssem Cardoso	used under a Creative Commons license. I grew up in Switzerland, in the Emmental – where the cheese comes from. It’s quite high up, so there was a lot of snow at Christmas time. I remember walking to school – wading, in fact – through snow up to my chest. It was really magical. I’d walk to school past a tiny church and past the forest, which was beautiful. There were also loads of snow fights, of course! And we built lots of snowmen – once my grandad built a snowman who looked so scary that I burst into tears and ran back inside the house to get away. We would always celebrate Christmas with my Mum’s family. They’re very musical. My grandma always wanted to sing, so we would sit in a big circle and all sing together. There’d be three guitars and a flute, and we would sing these really ancient Swiss-German children’s songs. Songs about baby Jesus and the donkey, or about candles. They aren’t very well-known songs, they’re really old, and not really ‘serious’ carols. Some of the songs I literally haven’t heard anywhere else. A lot of the songs use really old Swiss-German words as well, which we could barely understand. Now, I look back on that time with nostalgia, because family dynamics change as people get older, and things change. My grandma died last year too, and she was really the heart of the family, so it definitely feels different without her. The special sense of community, that will always be there; but it’s different now. What Christmas traditions did you celebrate? In Swiss-German culture, we celebrate Saint Nicholas Day on 6 December. For us, Santa Claus comes on that day, not on Christmas Day. So children put their wellies out by the door the night before and then in the morning, they would wake up to find them full of nuts and chocolates, and then you eat Grittibänzen. Grittibänzen are these little men made out of sweet, braided Swiss bread. People go wild with them: they make them with little scarves and decorations. I used to believe, not in Santa Claus, but that someone in our village would walk around and fill up the wellies for the children on the eve of Saint Nicholas Day. I was so disappointed when I realised that it was my grandma who would fill the wellies, not some designated wellie-filler! On Saint Nicholas Day, Saint Nicholas comes to the school with his companion, Schmutzli. All of us were scared of Schmutzli, because he was this kind of horrible figure with a broomstick. Apart from that, we would always have the Christmas wreath with the four Advent candles in church; we would light one candle each Sunday before Christmas. And we would usually have a Christmas play and a choir. As I grew up in a Christian family, someone would always read through the whole Christmas story on Christmas Day, so that we were always reminded of why we were celebrating. Do you have any particular family traditions? Yeah, my siblings and I go into the forest with our parents and have mulled wine on the fire. Once, there was so much fresh snow that it looked like huge white tunnels running through the forest. It was kind of something that I took for granted at the time, but they’re such special memories now. What does Christmas mean to you, in terms of your faith? With every year, I feel like I struggle more and more with how people go wild with buying so much stuff – with how monetised Christmas is. This year, I really want to go deeper into what Christmas really means. In the Coptic tradition, for example, their understanding of salvation starts with the incarnation. We often focus, in the West, on just the cross – which is obviously hugely important – but the Coptic tradition really celebrates Christ coming among us, and the incarnation as part of the salvation message. I’ve been listening to sermons by the Coptic monk and missionary Atef Meshreky about the kingdom of God. One of the things that it’s got me thinking about is the fact that we often think of Christmas as being this fluffy, nice thing, but actually the first Christmas is so political – the Jews were waiting for salvation to come through a King, but then He’s born in a stable – it’s so dramatic and sometimes we forget that. It must have been such a lonely and scandalous time as. I wonder what Mary and Joseph would have thought if they’d known how their story is viewed now? There’s just something about tradition and the church calendar that I find really fascinating. Coptic Christians understand there being a special grace on particular days: Christmas Day is about new life and new hope, for example. We often don’t look deep into those elements of faith and tradition in our more contemporary church services, but I think they’re really fascinating. This was my first single ever; it came out about two years ago. I wrote this song when I was in London actually, and it was a rainy night. I’d come home really late after being in a café with a friend, and I just saw myself in the forest in Switzerland, with that snow I just talked about, and in that moment I just longed to be there. That’s kind of why I wrote it, because it was what I was dreaming of happening at the time – to be there, to experience that. I write a lot of my songs like that, where I’m writing about what I want to happen. 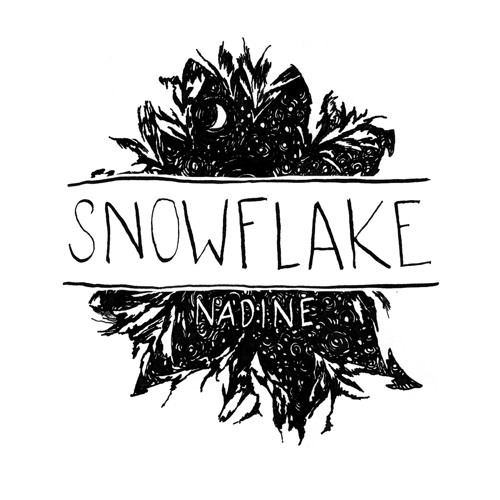 Nadine is a Swiss singer/songwriter based in London. Her music has been featured on BBC Introducing and The Ayala Show on Irish TV. She released her second EP, Exile, this year.